The participants in unicist residencies develop real solutions for the organizations they belong to. They assume the responsibility for developing functional solutions to the problems they are dealing with. Participants use the Unicist Reflection Process and its implicit pilot testing technologies to develop solutions in the unicist residency. Unicist counselors support this solution building process. The access to the root causes of problems requires the use of an action-reflection-action process to apprehend the concepts and fundamentals of the problems. This is a pilot test driven reflection that allows accessing structural sustainable solutions. These solutions are built using the unicist strategy driven root cause management that allows finding the root causes of problems, defining a solution and developing destructive and non-destructive pilot tests until the functionality has been confirmed. The development of unicist residencies was influenced by medical education because both approaches deal with complex environments. Medical residencies deal with the cure of patients in the Teaching Hospitals while the “residents” learn to manage an expertise. The activities of Teaching Hospitals in Medicine and the Teaching Hospitals in Business have the same goal, solving problems, but are totally different in their operation because the unicist residencies need to deal with the concepts and fundamentals of the problems to access their root causes, which is not the case in Medicine. 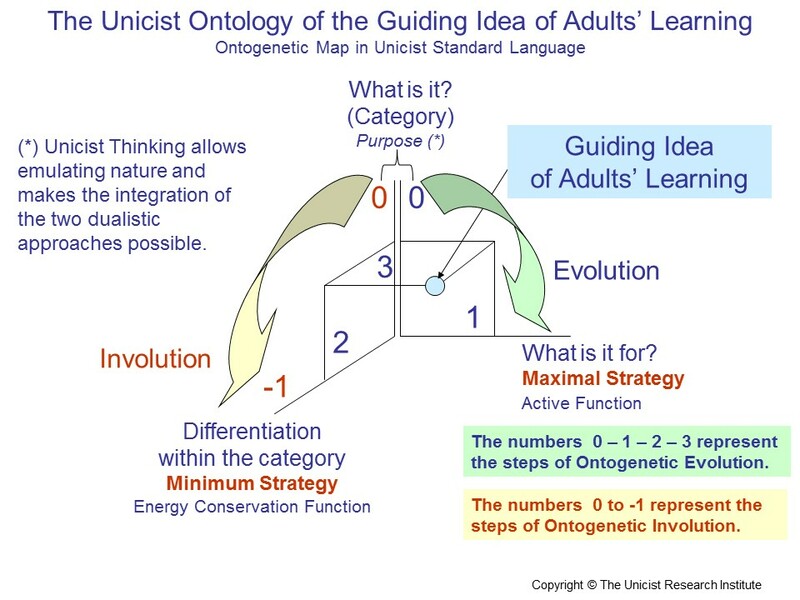 The Research on the Ontology of Human Learning developed at The Unicist Research Institute showed that the development of the guiding idea in the learning process of adults is the decisive step to begin the learning process. If there is no clear guiding idea, the learning process does not even start. The definition of the category of the “thing” that needs to be apprehended is the first step to apprehend its nature. The “What for” of a concept that an adult aims to learn sets the functionality of what is being learned. If the learner truly understands the “what for” of something, the information on this functionality could be used in the future as it would be stored in the long-term memory associated with a concrete use and added value. What is the differentiation within the category? Once the essence of an object of learning is apprehended (what is it?) and the functionality of this concept is known (what is it for? ), then the individual needs to approach the differentiation of this object of learning with other objects within the same category. Adults are only willing to learn if they know that the solution is “the best of the class”. The building of the guiding idea is the starting point for any learning process. Learning is one of the most freedom oriented actions. No one can truly force anyone to learn, no one can truly stop anyone from learning. For this learning process to take place, the learner makes an individual decision. When the guiding idea is not defined, the learning does not begin, when the 3 questions are not validated, and are taken as truths, preconcepts and fallacies prevail, but when they are answered and taken in functional terms, a new door opens for the learning of adults. And as Sun Tzu stated: Every battle is won or lost before it is even fought. The answer given to the essential questions of “What is it?”, “What is for?” and “What is the difference with others in the same category?” define the success or failure of the learning process. Business Hackers are individuals who need to implant business viruses in institutions in order to demonstrate that they are able to dominate them. They tend to do everything in their way disregarding the use of established methods, procedures and taxonomies to achieve goals. To introduce viruses they propose short-cuts to achieve profit. Their success is achieved when their proposal is accepted by the greed of their counterparts. Their butterfly behavior is sustained by conjunctural justifications and the exertion of power. They might use active power or the power of inaction. Their destruction goal is integrated by envy which is driven by greed and jealousy. They use greed to profit from the environment at a materialistic or emotional level while they feel jealous of the power the organization has. They are fulfilled when the organizational goals become degraded. They justify their actions by believing and saying that the organization is not such because it could not resist their actions. They are homologous to “computer hackers”. 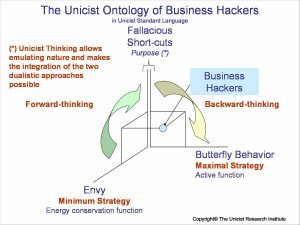 Inhibiting and entropy-inhibiting unicist business objects are the anti-viruses needed to neutralize their actions. Learning processes in adults require the existence of a real problem to be solved. When there is no real problem to be solved, the learning process has no substance and the “knowledge” cannot be stored in the long term memory because it is meaningless. Learning processes are based on the need to increase the value added to the environment so as to gain a better adaptive position for an individual. But a learning context is required before a learning process begins. The maximal strategy of a learning process is given by the need of improvement. The existence of a driver and the real need for improvement provides the will the individual “uses” as a catalyst in order to face and solve the problems of his/her learning process. Achieving the minimum strategy implies paying the prices to ensure learning. The price to be paid is that the individual needs to leave things aside in order to access the comprehension of a new approach. Learning implies leaving things aside. If the problem can be solved using the preexisting knowledge there is no need for learning because the problem does not exist. Therefore it is implicit in a learning process for unsolved problems that the individual leaves aside the preexisting approach and enters the comprehension of the new approach without cutting it down to what s/he knew. Adults only do so when they really need to solve a problem. Improvement is the active function and learning the energy conservation function. Only people who need to improve will be able to learn. People who enter in a learning process without having a real need to improve in order to solve real problems just enter in self-fulfilling activities.  This lecture is for the group of the “Organization Committee” and is open for guests. It will take place as a “Hangout On Air” on November 8th at 12:00 pm US-EST. This discovery is a major breakthrough in the research on human behavior that was based on the complexity research methodology. 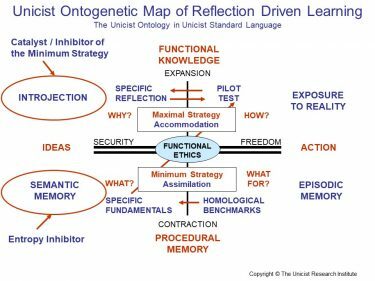 The discovery of ontointelligence, the intelligence humans use to access the nature of reality in order to adapt to the environment, increased significantly the predictability of human behavior and the possibilities to influence it. 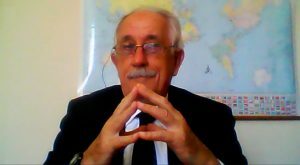 This lecture is the first lecture for the preparation of the cases of the XI International Unicist Conference that will take place in September 2014. We invite you to participate. It will begin at 12:00 pm (US-EST) sharp. The unicist logical approach allowed defining the potential possibilities of a business. The discovery of the logical structures (named ontogenetic maps) that underlie the nature of individual, institutional and cultural behavior allowed modeling the adaptive aspects of reality. 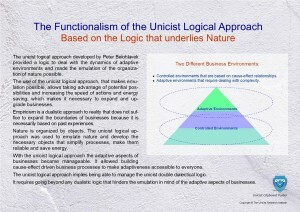 The unicist logical approach uses these structures to emulate the dynamics of businesses based on their models. Models are dead or live structures depending on the mind of the one who uses them. The double dialectical approach allows emulating dynamic live models in mind. 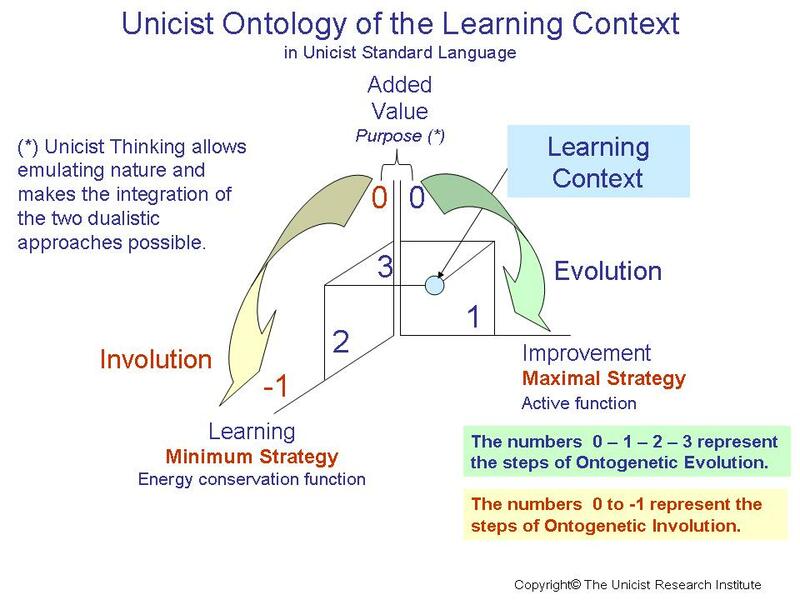 It requires having a rational knowledge of the ontogenetic maps and using the unicist reflection process to make them work by developing actions based on the use of grounded knowledge to assure results. Empiricism is a dualistic approach to reality that does not suffice to expand the boundaries of businesses because it is necessarily based on past experiences. 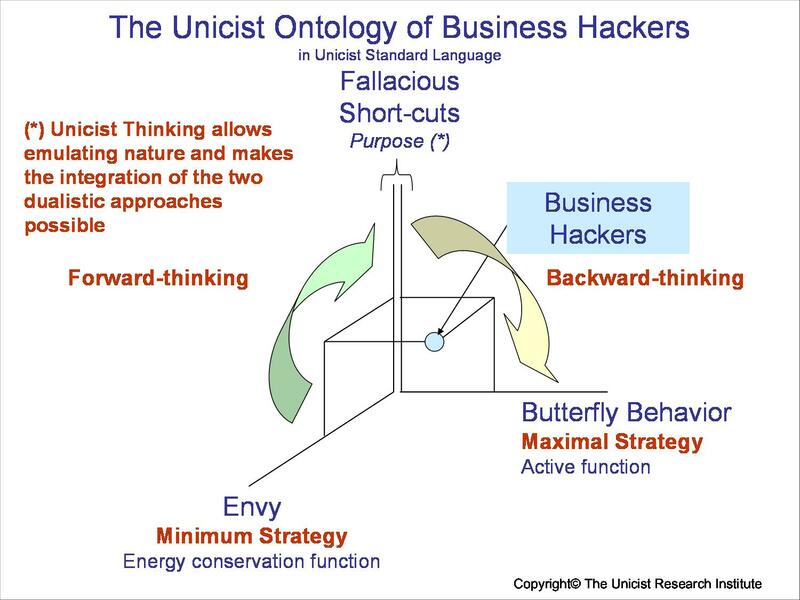 The use of the unicist logical approach, that makes the emulation of reality possible, allows taking advantage of potential possibilities and increasing the speed of actions and energy saving, which makes it necessary to expand and upgrade businesses. 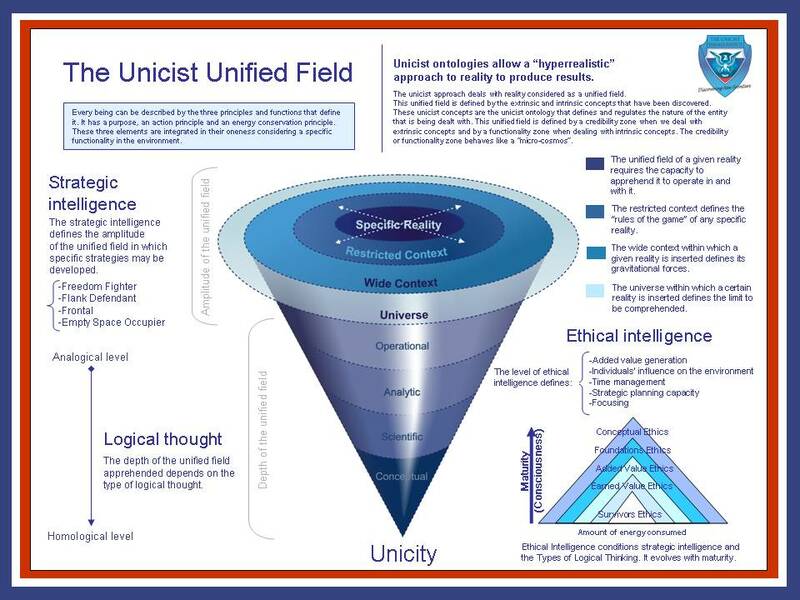 The unicist approach implies being able to manage the unicist double dialectical logic. It made the emulation of nature possible and thus opened the doors for accurate diagnoses, scenarios, strategies and architectures that allowed defining the possibilities to produce results and make them happen. It required going beyond the dualistic approach that hinders the emulation of evolution and limits human activities to static environments. We invite you to enter into this approach at a personal level to empower your personal strategies. The neural functionality is dualistic. Neurons are “on” or “off”. Dualistic Dialectics vs. 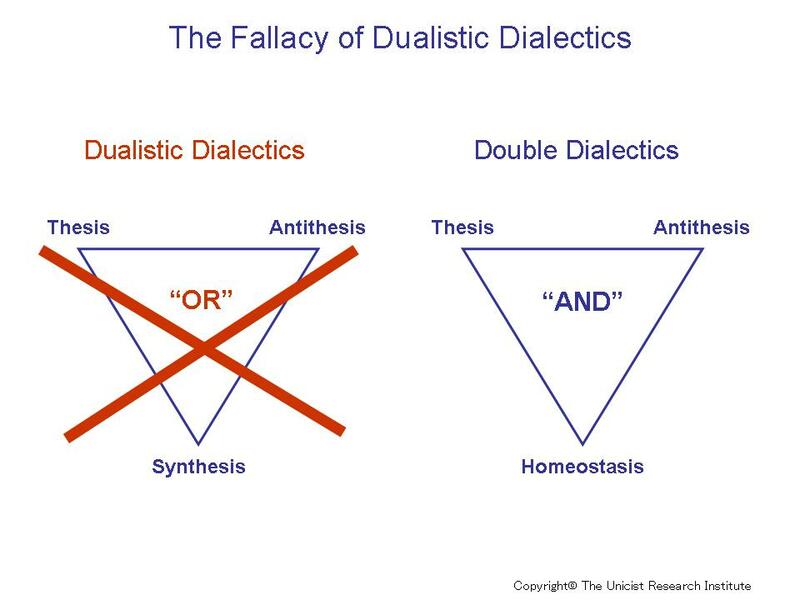 Double Dialectics is the battle between the disjunction “OR” and the conjunction “AND”. The dualistic dialectics of Hegel and Marx transformed this dualistic approach into a social myth that provided an oversimplified perception of reality and a way to influence it. Both dialectics are fallacious because they do not emulate the structure of nature. The dualistic thinking necessarily fosters a non-adaptive behavior that is driven by idealistic, ideological, materialistic, spiritual or egocentric needs. Dualism is necessary when personal needs prevail over functional adaptation. The consequence of dualistic thinking is that people believe in a dialectical behavior. Adaptation becomes impossible when using dualistic thinking. 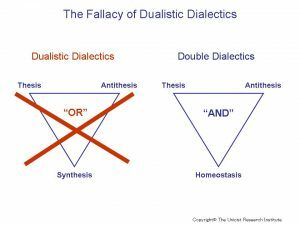 But dualistic dialectics has proven to be fallacious to understand and influence evolution. The unicist double dialectical logic allowed using the dualism of neural functionality but emulating the functionality of nature. In the short run, the benefit of using dualistic dialectics is that it transforms humans in judges of reality instead of responsible participants. 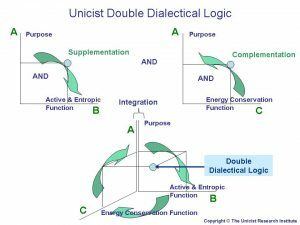 Why use the Unicist Double Dialectical Logic? 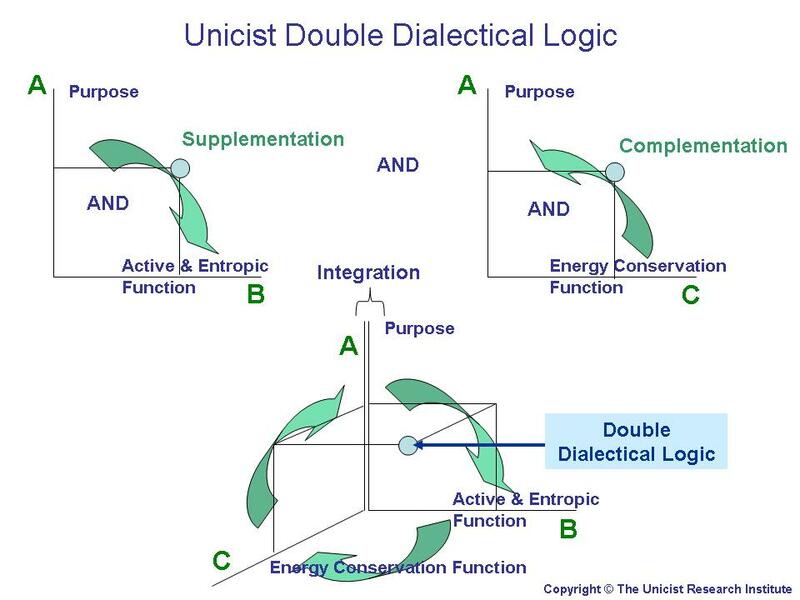 The unicist double dialectical logic uses the dualistic operation of neurons to build a mental emulation of the structure of nature that allows dealing with the adaptive aspects of reality, managing the integration of their double dialectical behavior. Unicist thinking is the name given to the process that allows building the double dialectical logic. 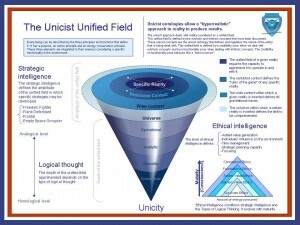 Unicist thinking allows emulating in mind the structure of adaptive aspects of reality in order to manage them. It provides the necessary operating system to manage adaptive systems to expand the boundaries of businesses and infer future scenarios in order to adapt to them. 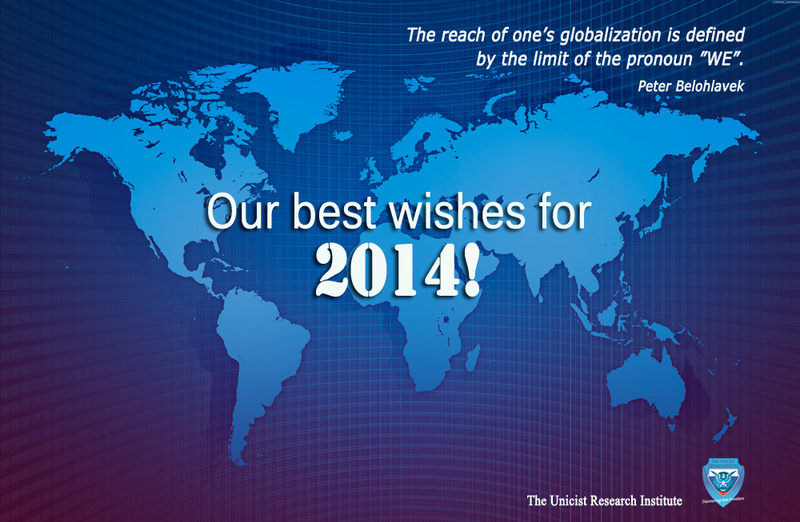 Unicist thinking allows defining the nature of reality in a reasonable and provable way. It is based on double dialectical thinking in order apprehend nature emulating the ontogenetic intelligence of nature. The unicist approach to leadership is a process that allows leading people minimizing the energy that has to be invested to influence them. It is a role centered approach that uses roles as objects minimizing the necessary power to be exerted. 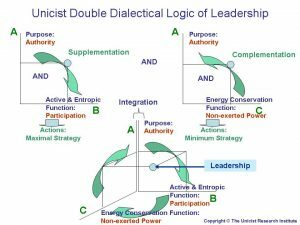 The unicist double dialectical approach allows managing groups as adaptive systems, forecasting their dynamics to be able to respond to their demand while being one step ahead in order to be able to be followed. The dualistic approach transforms leadership into an over-adaptive process, where dominance, submission and opposition prevail. As dualistic approaches cannot define group dynamics, they need to “rigidify” the relationships in order to avoid individualistic-anarchic behaviors. 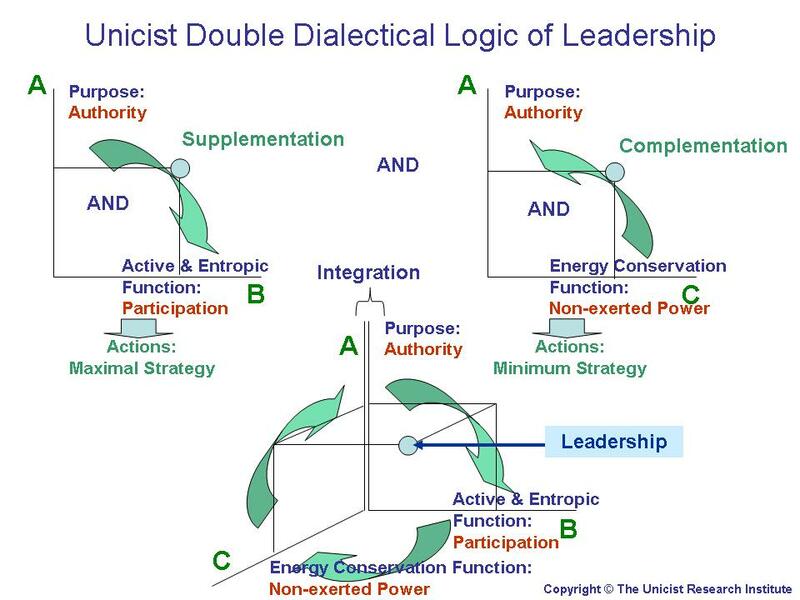 Dualistic leadership tends to transform participation into manipulation or submissiveness and non exerted power into power exertion which destroys group synergy. 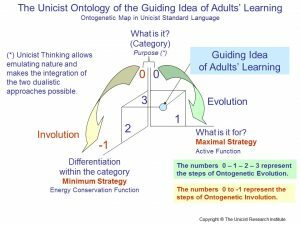 When we talk about the ontogenesis of knowledge acquisition we mean the natural steps that need to be considered when learning or when a learning process for other is being designed. Knowledge can only be acquired when individuals have made a conscious decision to learn something. Knowledge only exists when it is stored in the long term memory which requires being meaningful and useful. 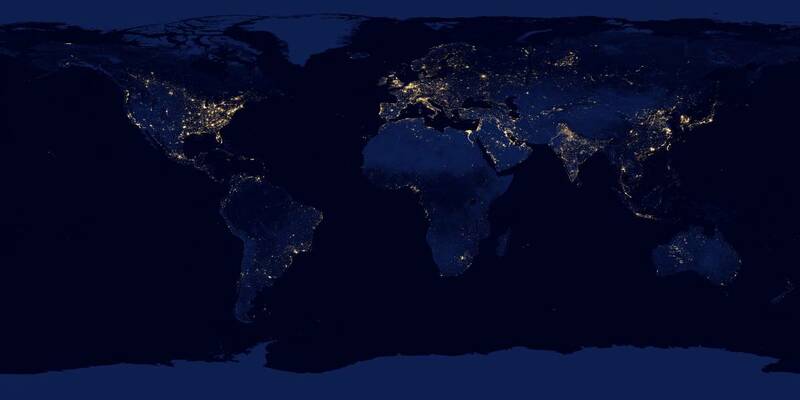 While adapting to reality implies a high level of energy consumption, building parallel realities provides a feeling of comfort, making the individual feel in power of the situation in the short run. The unified field needs to be approached following the natural steps to apprehend a specific reality and the possibilities the individual has. 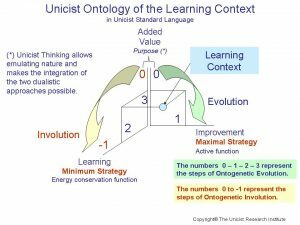 The Unicist Standard for Personal Conscious Evolution described by Peter Belohlavek defines the ontological structures and the taxonomies that can be influenced to foster the evolution of individuals. 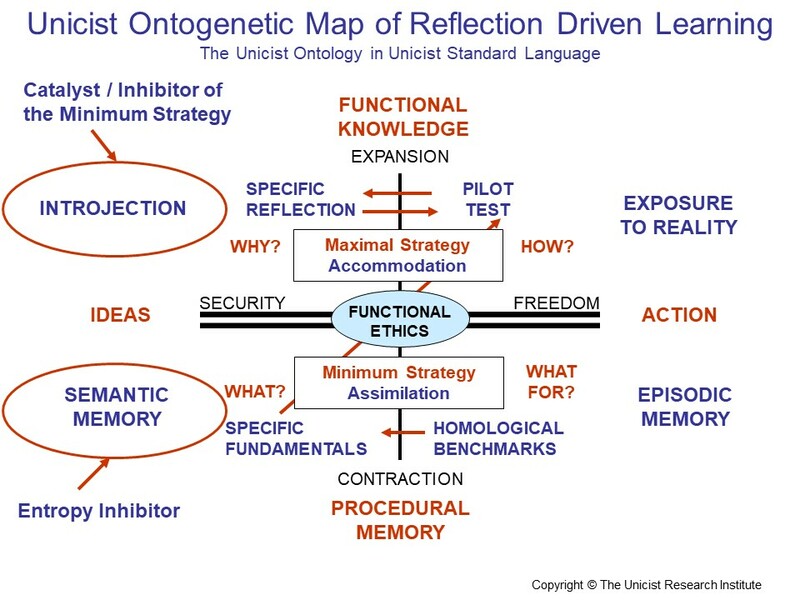 The US is integrated by the taxonomies to approach ontointelligence and the fundamentals of the unicist reflection capacity and of conflict management.  NOTE: The Unicist Research Institute is the pioneering organization in the field of human adaptive behavior ontological research. More than 3,500 ontological researches were developed since 1976 until September 2010 in the field of individual, institutional and social evolution. 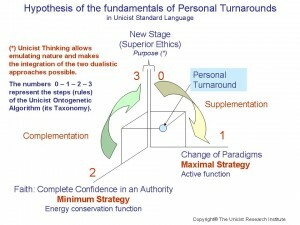 A personal turnaround is a sort of “resurrection” made by an individual who enters in a superior stage. 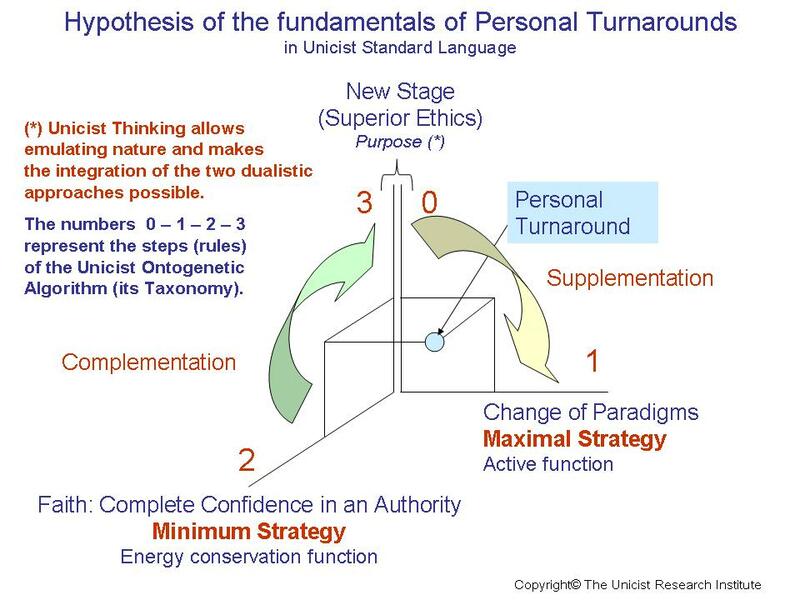 The ontological research on personal turnarounds in business has been running for 10 years now and has included 23 individuals and the follow up of their evolution. This research is now in its final stage. The publication of this post has been triggered by the need to foster the turnaround of four individuals, one is extremely young, two are middle aged and one is a senior. The conclusion of the research will be considered valid if the forecast of the four cases is accurate. Many of the cases of turnarounds in business were triggered by the desire of achieving a superior level in terms of financials. What became evident is that turnarounds are possible if individuals envision a new stage and their role, have changed the paradigms to deal with their environment and have “faith” (implying complete confidence in an authority). They require a high level of self-confidence to launch a different stage and the capacity of doing the necessary amendments that allow “guilt free” closing of the previous state. When these conditions cannot be fulfilled individuals degrade to a lower level. The financial trigger works often as a mind-trap hindering the upgrades. Turnarounds are sustained by the generational responsibility of individuals. They become extremely difficult when the environment has a high level of individualistic components. Personal turnarounds are necessary when needing to deal with a superior business ethics. Personal turnarounds are extremely rare.